Bobby Jones is partnering with Dogleg Right to produce premium custom fit and custom made putters. The companies will collaborate on a variety of limited edition Bobby Jones-branded putters in a multi-year, worldwide venture. As part of the initial launch, Dogleg Right is designing and handcrafting three series of putters – the Silver Anniversary, Grand Slam and Bespoke Art – the companies say will pay homage to Bobby Jones himself. Each putter in the series will feature adjustable weights, interchangeable necks, adjustable loft, lie and toe hang as well as Dogleg Right’s proprietary face mill patterns. Bell said the “Silver Anniversary” line, intended to celebrate the 25th Anniversary of the Bobby Jones brand, features “modern classic designs’’ that are crafted from “American Rustless” 303 Steel with an exquisite multi-faceted satin mist finish on the upper surfaces, hand polished soles and the finest custom options available. In addition the Silver Anniversary line putters come complete with Bobby Jones logoed grips, head covers and shaft labels. Prices start at $699.99 for each putter. The “Grand Slam” line offers a series of four commemorative putters that honor Jones’ “Impregnable Quadrilateral” in 1930. The four timeless head styles will feature intricate custom options, and are completed with hand finishes. The Grand Slam models, GS-1, GS-2, GS-3 and GS-4 will come complete with Bobby Jones logoed leather grips, matching head covers and Limited Edition Bobby Jones shaft labels. The Grand Slam line of putters will be available in limited edition quantities with just 10 each of the first four styles available for purchase. Prices start at $799.99 per putter. Finishing out the launch is a series of “Bespoke Art” one-of-a-kind models. 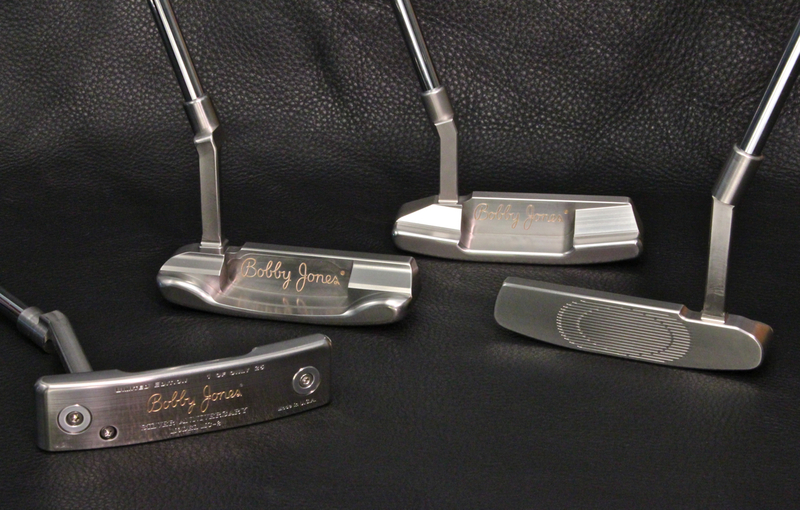 The Bobby Jones Bespoke Art pieces start as one of the models from the previous two lines and are transformed into a one-of-a-kind putter by putter designer Dave Billings. Each Bespoke Art putter is made precisely to the customer’s every specification and aesthetic preference, offering the finest in materials, performance technologies and expert craftsmanship. Each putter will include a Certificate of Ownership and notes and drawings from Billings to the owner. The initial Bespoke Art collection will be made up of 10 pieces total for Spring 2015 and will start at $1,499.99. Exotic materials such as Stainless and Carbon Damascus, Mokume Gane and Titanium Damascus can be selected to the putters.